Well, hello there sweet one. Look how lovely you are! The Hayden Color Block Baby Blanket is a simple crochet pattern that is designed using Ewe Ewe Baa Baa Bulky washable merino yarn. It is easy to make, easy for new parents to care for, and snuggly soft for the new baby! Baa Baa Bulky yarn comes in great colors that are perfect for baby. Mix and match a light color and a darker tone or match it to the nursery. There's tons of great options! I hope you enjoy making the Hayden baby blanket for a new little one in your life! Find the free crochet pattern below. Find the yarn at a Ewe Ewe yarn shop near you or here on our website. 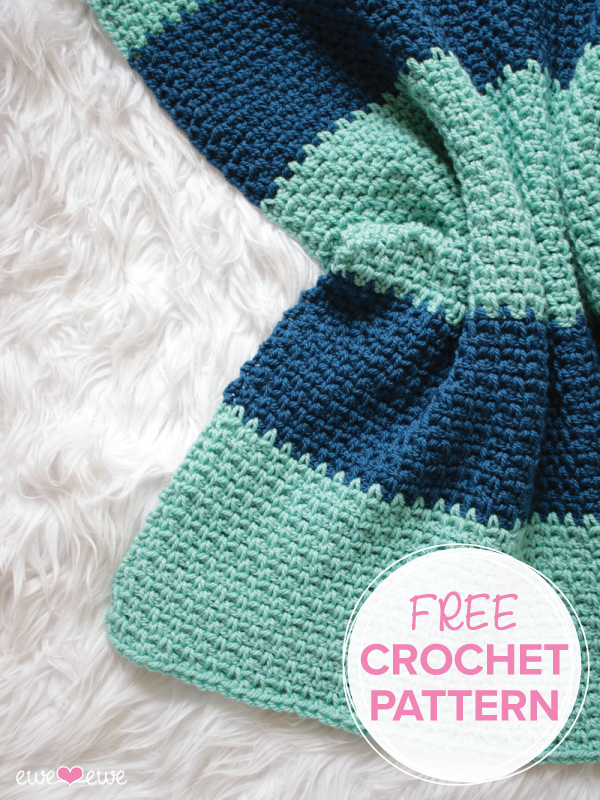 Knit this free pattern with Baa Baa Bulky merino! Vickie Howell in the Ewe Ewe Yarns booth with me at TNNA. Ok, it's a little ways away but I am so excited to be a part of The Knit Show with Vickie Howell! In October this new TV-quality knitting and crochet show will launch on YouTube and I want you to be there. I will be a guest on the show (I get to fly to Austin this month to film in studio!) and be working on some great projects with Vickie. I can't share too much just yet but I want you to go over to theknitshow.com and subscribe. That way you'll get updates about when the show will air and details about all the FREE patterns that go along with the program! It's the end of 2016 and here's what were the most popular knitting and crochet patterns this year. There's a whole range of techniques and styles and there's a lot to choose from! Both the Buttercup Baby Blanket and the Peek A Blue Blanket are easy knitting patterns for blankets that show off a few stitches in a sampler style. They both features Ewe Ewe's Ewe So Sporty washable merino yarn. The Nectar Scarf has a simple bias knit design that uses three colors in a unique set of colors in constantly changing stripes. The Double Deco is a much larger and more generous shawl that meshes four colors to create a modern wrap using Ewe So Sporty yarn. We love crochet around here! The Wearever Wrap is the best-seller once again and our newer Show Off Shrug is turning heads, too. Made in Wooly Worsted yarn, these two shoulder-warmers will hug you in style. A good, basic beanie never goes out of style. That's why the Family of Hats which has a hat for everyone made our best-seller list yet again! The Sand & Sea hat is also at the top of the charts because of it's simple but fun-to-knit Fair Isle patterning. We hope you enjoyed Ewe Ewe's Best Of 2016 knitting and crochet patterns. Use code BESTOF2016 to get 25% OFF these patterns either here on eweewe.com or Ravelry through 1/7/17. Summer is a great time to knit. Toss one of these small projects in your beach bag and secretly prep for winter while catching some rays. These lightweight cowls are perfect for when the mornings start to get cooler. You'll be ready! The Rush cowl features alternating stripes of color and lace. Find your perfect color combo of Ewe So Sporty yarn. This one uses Teal and Aquamarine. Rocky Ridge Cowl knitting pattern is a one ball project! It has a simple lace pattern that is great for a beginner looking to move on to a new challenge because it's not too big. Try it in your favorite color of Ewe So Sporty yarn. Double the squishiness here! The Color Theory Cowl holds the yarn doubled to create a tonal color shift around the loop. This one uses soft colors but bold colors look great, too! The Snow Business Cowl can either be knit as a snuggly neckwarmer like the one shown here or sized up into a larger cowl. You choose! Look boho chic in the Bohemian Grove cowl. Fun fringe is where it's at! This cowl comes together quickly and uses two balls of your favorite color of Ewe So Sporty yarn. A soft and subtle pattern makes the Freckles Infinity Scarf an elegant choice. It combines basic knits and purls to create a playful dot pattern across the fabric. Pick your favorite color of Ewe So Sporty yarn and make yours now. Take a minute to check out our yarns and find a Ewe Ewe yarn store near you! The Wearever Wrap is one of the most popular patterns here at Ewe Ewe and totally the most popular crochet pattern. It's a fun-to-work half granny square design and uses 6 colors of Wooly Worsted yarn. The color combinations that people have done are out of this world. This Berry dream by ivillarreal1997 on Ravelry is a show-stopper! And I am into these blues and blacks by RevengeMe. I think I could rock this combo with a pair of jeans and a simple white t-shirt. And check out this colorful masterpiece! Stripespolkadots knocked it out of the park with this bright and punchy rendition. So fun! Find the Wearever Wrap pattern here and choose your favorite color combination of Wooly Worsted yarn here. Then send me photos! Meet our newest fun-to-make pattern! The Show Off Shrug is a loose, oversized wrap that drapes gently over the shoulders and around the back. The shrug features both knitting and crochet so not only do you look cute but you can show off all of your skills in one awesome project! A funky vintage-style granny square is worked with a super-stretchy knit border that hugs you just right. It's a fun project to make! The Show Off Shrug is available in S/M and L/XL sizes. The one on the model is shown in the S/M which uses eight balls of our soft Wooly Worsted yarn. Check out the Show Off Shrug pattern here or on Ravelry.